Perhaps getting a puppy, starting all over again and having to think about all the considerations that having a new dog brings are just not for you. Perhaps you are looking for an older dog as a companion for yourself or for another dog in your family. There are lots of reasons for people preferring an adult dog rather than a puppy. Sometimes, we can be aware of an adult dog looking for a new home- a breeder needs to re-home one of their dogs, someones circumstances may have changed and they have no choice but to re-home, we could be looking to re-home one of our girls too. To take an adult dog looking for a new home is an incredibly special and brave thing to do. Everything that they have ever known has been turned upside down and round about. You have to invest lots of time, energy and patience to get to know your new wee friend. Gaining the trust of your new friend will take time and it's a very special person who is able to undertake such a task. From our point of view, I'd go as far as to say that there is even more scrutiny of the person looking to take an older dog. I can say with complete honesty and conviction that giving up any dog is one of the hardest things you'll ever have to do.....handing over your pet to a new family. It isn't just a dog, it's a member of your family, a listening ear, a cuddle companion.. Your house isn't a home without them! You absolutely want to make sure that the family is right for the dog. 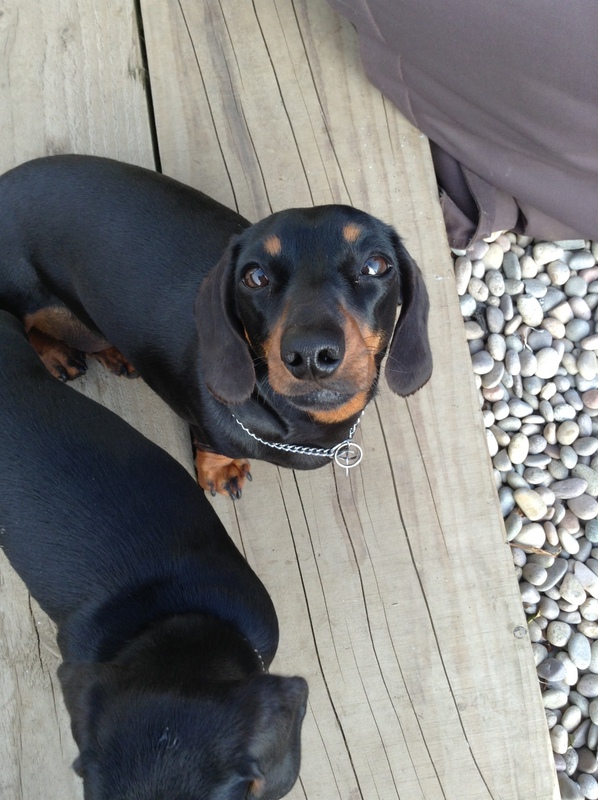 Ina was re-homed with a wonderful family who were a perfect fit for her. She gets so much attention and is very, very spoiled in her new home. It makes it so much easier to know that she is the centre of their world and now trusts and loves her new family as much they do her! She still gets her cup of tea in the morning and more belly rubs than she could ever hope for! Both old and new families keep in touch to learn from and share news with each other. "Aggie is Effie's first daughter. She is a mini smooth red- her coat is a deep mahogany red and she is simply stunning. She is a real mix between her mum and dad- she has inherited a love for fetching from her Dad and has her mum's "love me" eyes. She has a very gentle temperament and is a little cautious of new or different situations. Aggie loves to burrow under the covers for a cuddle in- the warmer and cosier, the better. She absolutely hates going out in the rain - her pleading eyes and her pitiful walk towards the door say it all! "Maisy is a shaded red girl. 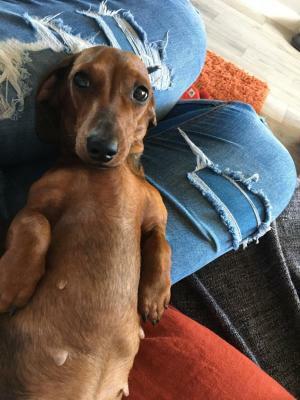 She is constantly active and enjoys 'playing' with the younger girls to use up her boundless energy; I'm sure she's actually a wippet in dachshund clothing. 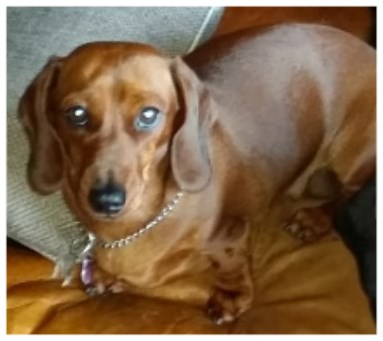 Maisy is a very slight and small dachshund and is the most nervous and cautious of all our girls. She, unlike our other girls, needs time to 'size up' anyone new from a safe distance- usually from behind my leg! She is also a 'pretender to the throne' and from time to time will challenge Effie. She's a wee poppit and always seems so grateful for any attention. Maisy has been mum to three litters and was very attentive, protective and loving. She is always interested in and caring of any of our other girls' puppies too- she was more than happy to take over mum duties whoever the opportunity arose! "